Fall is the best! 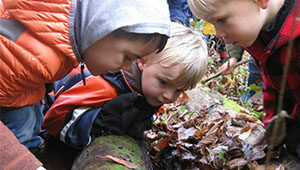 Our autumn weeks will take advantage of all the season has to offer for hands-on exploration and learning. Topics will include Seed Shapes, Leaf Colors, Forest Masks, Owls, Bats, and Spiders! Each session will combine crafts, games, and short hikes (rain or shine) as we discover the wonders of fall. Children must be accompanied by an adult. Lessons will include an outdoor component each time, so be sure to dress for the weather. This six-week series will meet on Wednesdays, September 19, 26, October 3, 10, 17, and 24. For ages 3-5. $35 members; $50 public. Membership discount will be applied at check out when using your member account to register. Register Now for Nature’s Little Explorers: Fantastic Fall! Baltimore Woods Nature Center fosters environmental stewardship of our natural world by offering immersive programs and a place in Central New York for everyone to cultivate appreciation for and personal connections to nature through environmental education, recreation, play, and research. We put nature in your hands. BWNC accomplishes this through teaching and interactive programs that take place at Baltimore Woods headquarters in Marcellus, NY, as well as in urban, suburban, and other rural landscapes of Central New York.